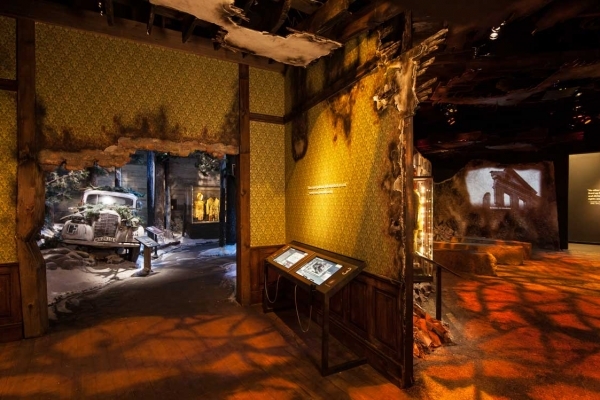 Built to honor the last surviving WWII veterans, the Campaigns of Courage Pavilion: The Road to Berlin and The Road to Tokyo at the National WWII Museum in New Orleans has opened to rave reviews. The permanent $35 million installation takes guests on an immersive interactive journey through one of the most cataclysmic events in human history. The Museum was recently named the No. 3 Museum in the United States in TripAdvisor’s Traveler’s Choice Awards. Uniting the entire interactive aspect of the Campaigns of Courage Pavilion is the Dog Tag experience, a personalized RFID (Radio Frequency Identification) card. To tell the stories of individual veterans and other people who served during the war, a series of themed interactive kiosks, called Dog Tag Stations, allow guests to follow the video story of 50 people drawn from the Museum’s archived interviews. Each story video was produced by Atherton Pictures. The Dog Tag Experience allows guests at the National WWII Museum to save and collect artifacts to their RFID Dog Tag, which then can access at home through a companion website. From Dog Tag Station to Dog Tag Station, the stories evolve to reveal each individual’s WWII saga. These stories form the backbone of the Dog Tag Experience, an integrated RFID tracking and database system, created by Unified Field. Guests begin their journey on an interactive 1940’s Pullman car during an immersive recreation of leaving home for the war. They register their Dog Tag RFID cards with their email addresses and select a person to follow at each station. (click to learn more about the creation of the train). During a five-minute recreation of the journey off to war, video screens on the windows of the train car simulate a cross-country journey with sweeping panoramas of the American countryside, providing an opportunity for guests to register their cards and select a veteran from a list of 50 unique veterans to follow through the course of the war at subsequent interactive kiosks. “Personal narratives embody the human dimension of the exhibits inside Campaigns of Courage and, through the use of technology, bring to life the story of WWII. The digital dog tags bring home the courage and sacrifice of the war’s participants in a powerful way by connecting visitors to the journey of real servicemen and women. And, after leaving us, guests can go online to continue their exploration and discover even more. It’s history that will follow you home,” –Dr. Gordon H. “Nick” Muller, President and CEO of the museum. Each Dog Tag Station is themed to match the surrounding physical exhibit, allowing guests to move from the deserts of North Africa to the streets of Berlin and the jungles of Guadalcanal. The RFID tracking system keeps a running tally of videos viewed by guests so that they can watch videos from Dog Tag stations they missed, either in the Museum, or later at home. Packed with multimedia content such as archival videos and oral history interviews collected by the NWWII’s content team and edited by Atherton Pictures. 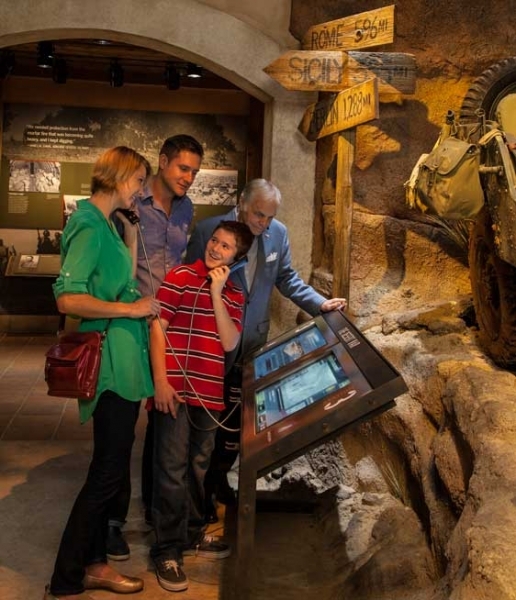 Guests can peruse animated battle maps, photographs, exploded 3D artifacts and more. The War Station and My Journey Kiosks transport visitors onto the historic battlefields and into the minds of WWII veterans. Each Dog Tag station is themed to the surrounding exhibit. To create the 3D vehicles, Unified Field’s researchers and 3D modelers worked to create historically accurate renderings of tanks, ships and airplanes and their internal components. To add an element of playfulness, guests can disassemble these vehicles to view internal components such as machineguns, cargo holds and engines. Models include: the Sherman Tank, the Liberty Ship, LVT, P-51 Mustang, and 11 other custom rendered 3D Models. 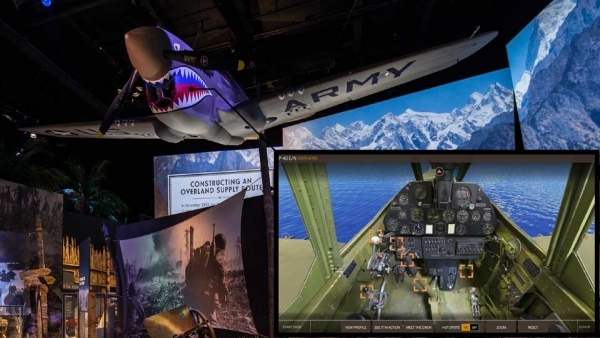 The Flyboys interactive kiosk puts museum visitors behind the stick of three classic fighter planes such as the Messerschmitt Bf-109, the P-51 Mustang, and the P-40 Warhawk. Positioned next to the real restored fighters suspended from the ceiling, the Flyboys interactive provides a 360 degree view of cockpit interiors, packed with hotspots which explain the buttons, levers and switches. Archival videos show the planes in action while oral history videos transport guests into the hearts and minds of veteran pilots. The flyboys cockpit viewer allows guests to explore the cockpit of three historic warplanes: the P-40 Warhawk, P-51 Mustang and the Messerschmitt bf109. The National WWII Museum tells the story of the American experience in the war that changed the world – why it was fought, how it was won, and what it means today. Dedicated in 2000 as The National D-Day Museum and now designated by Congress as America’s National WWII Museum, it celebrates the American Spirit, the teamwork, optimism, courage and sacrifice of the men and women who served on the battlefront and the Home Front. For more information, call 877-813-3329 FREE or 504-528-1944 or visit www.nationalww2museum.org. Follow them on Twitter @WWIImuseum or on Facebook. Research and Scriptwriting: History Associates, Inc.